BEFORE: I entered the 21 Day Challenge contest with this photo because I wanted a change in my lifestyle, specially in my diet. I want to feel comfortable in my own skin and body. I want to look in the mirror and like what I see in my reflection. Also, I want to feel proud of myself when I see the results of this program. Finally, I would like to be in better physical shape and I wish to have my muscles more tone up. 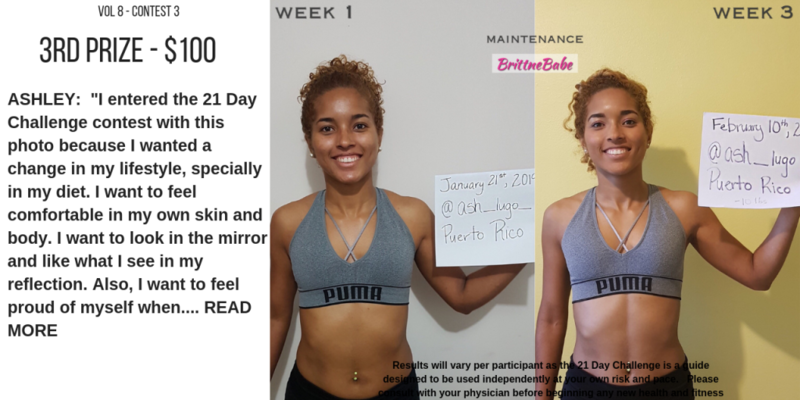 21 Days AFTER: The 21-Day BrittneBabe Challenge helped me to be patient with my progress and to be more focused with my body goals. I learned how to be disciplined and persistent. Each day I gave the best of me on the workouts, even when I was tired. Now I have a better physical condition, and I feel more confident with myself. But this doesn’t stop here, I will continue with this journey of fitness, because this has become my lifestyle.